Heat oil in a kadhai and temper mustard seeds. Add cumin seeds, broken red chili and chopped onions. Fry for 2 mins. Add ginger-garlic paste and chopped tomatoes. Mash the tomatoes pulp. Add blended lauki. Add turmeric powder, red chili powder, paav bhaji masala, dried fenugreek leaves and salt to taste. Cook for 2 mins. Add curd and 1/4 cup water. Cook it covered till the water is absorbed and gravy becomes little thick. 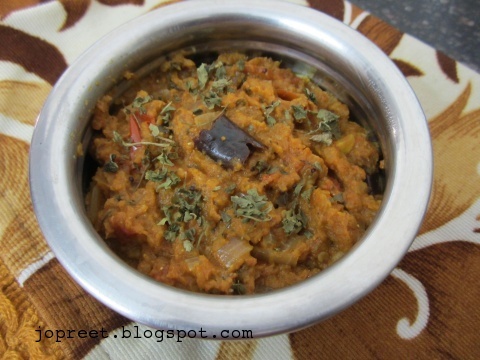 Serve hot with rice or roti. wow .. this is interesting.. to day i am thinking of making lauki.. may try this.. Interesting recipe….love the addition of pav masala…must be really delicious.. Interesting recipe. Addition of pav bhaji masala, enhances extra flavor in it. 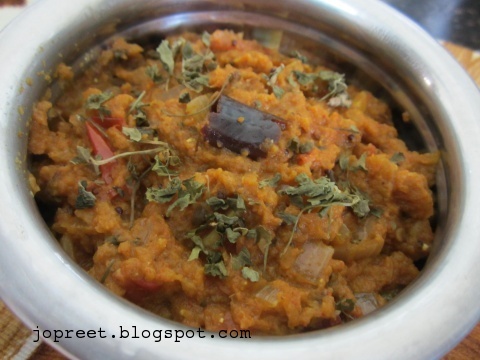 Never heard of lauki ka bharta..new and interesting recipe..